If you or your child is a college student and is anticipating moving to a college campus or nearby apartment, you’ll be in need of one of the moving companies in Washington DC. Suburban Solutions is one of the go to choices for people who are moving out of their house and starting college. As a moving company, we have helped freshman students move into universities throughout the DC area. If you or your child in need of a moving service now, or have questions about pricing, call us to learn why we are one of the moving companies in Washington DC. The following are tips provided by our professional team who has helped move thousands of satisfied customers. Most college dormitory rooms have limited space. Deciding what you will take with you and what you will leave behind might be a difficult choice. You’ll want a few comforts to remind you of home, but you also don’t want to bring things that you won’t use. Before contacting any moving companies in Washington DC, take time to organize and pack your items. If you prefer, call Suburban Solutions for an estimate for us to pack your belongings in addition to moving them. Use quality moving boxes, tape, bubble wrap, foam, etc. Place heavier items in smaller boxes so that you are not carrying more weight than necessary. 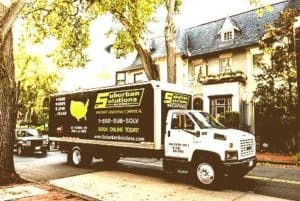 If you’re moving a long distance or out of state, we encourage you to hire Suburban Solutions among the many moving companies in Washington DC. You can count on Suburban Solutions to be at your location on time and with all of the equipment needed to move your belongings safely and expediently. We are proud of our reputation for reliability and excellence among the many moving companies in Washington DC. Suburban Solutions is an ideal choice for students moving to college. Our student moving services are affordable, efficient, and professional. By opting for our student moving service, you won’t need to worry about driving a large truck, loading heavy items, or returning rented moving equipment. We are a reliable student moving company. We offer transparent pricing with no hidden fees. To receive a complimentary quote, please call us today and learn why of all the moving companies Washington DC offers, many students choose Suburban Solutions.